We swoon when he looks at us. But will Fiona? Cincinnati's famed hippo Fiona has her first public suitor. 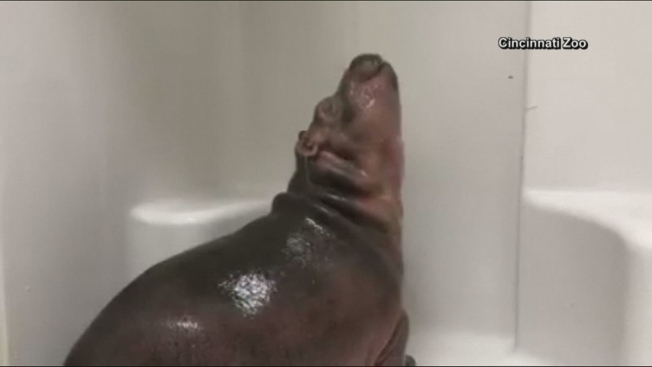 A 2-year-old hippopotamus named Timothy at the zoo in San Antonio, Texas, has launched his courtship via social media. Posts declared her the "most beautiful hippo" he's ever seen and wonder if they can be "boyfriend and girlfriend" someday. Fiona's only a year old, and her Cincinnati Zoo handlers have a lot of questions before she'll be ready to date. She became an internet sensation, drawing millions of social media views, as the zoo posted progress reports and photos after her Jan. 24, 2017, premature birth at a dangerously low 29 pounds (13 kilograms). Her visage has been on T-shirts, ornaments, cookies and even beer. And the Cincinnati Zoo asked Friday via social media if Timothy could get used to all the attention to Fiona and how he felt about "paparazzi." Timothy's post said his family has media experience, because his grandfather, Tumbo, was a cover model for National Geographic magazine. Fiona the hippo made her debut in Cincinnati on Thursday and seemed to take pure pleasure in wowing her spectators. Her audience was restricted to the media, but that didn't seem to stop her from putting on a show. 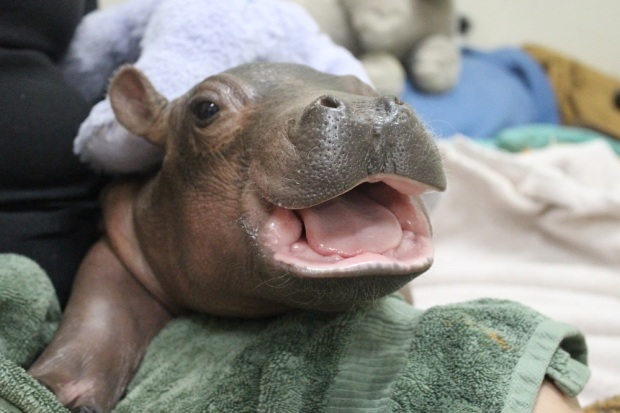 The 4-month-old hippo swam, ran, and hopped her way into the hearts of those who were there to show her off to the world. The zoo staff kept in step as she got acclimated to a 9-foot pool in the hippo cove. Fiona was born six weeks premature in January and severely underweight at only 29 pounds. She's now a whopping 270-plus pounds and can hold her breath underwater for up to two full minutes. Zoo officials say she's gaining weight and strength, but she's not quite ready to make a public appearance. Caretakers are hoping she can be on exhibit sometime this summer. Just before Fiona's first birthday, the Cincinnati Zoo's mammals curator Christina Gorsuch said the preference will be to keep her home when she reaches breeding age at about 5 years and to bring in a male hippo. "It will be great for her to be able to stay here her entire life," Gorsuch told The Associated Press. "We never know for certain if that will work out." Gorsuch also said there will be "plenty of boys" for Fiona by then because of the number of hippo births in recent years.